A patio garden is an ideal way to brighten up a small space while offering a way to grow delicious fruits, vegetables and flowers. This type of garden is also perfect for amateur gardeners who would like to begin learning the fundamentals of growing plants. When planning a patio garden, there are several important things to consider that will help to ensure that the new plants will be able to thrive and produce beautiful flowers and fruit. The first thing a person will need to do before creating their garden is carefully inspect the patio area to determine the features that can be used to help plants thrive. For example, it is important to know which areas receive the most sunlight. Additionally, a person will want to make sure that the area is not accessible to birds or other small animals if they will be growing any type of food. Once a person knows about the types of plants that can grow in their outdoor space, then they will want to decide upon which ones they would like to grow. Many different types of plants thrive in a patio garden such as herbs, flowers and small vegetables. For beginner gardeners, it may be best to select only one type of plant and add more as they gain experience. However, a person who prefers to grow flowers may decide to include several different types to enhance the beauty of the blooms. Garden containers come in an array of shapes and sizes. They can also be made of plastic, clay or metal. Generally, the material that a container is made from is only aesthetic; however, it is important to make sure that they are the right size for the type of plant that will be grown. They should also have small holes at the bottom to allow drainage. After planting the flowers or seeds in a container filled with potting soil, it will be necessary to continue to care for the garden each day. Every plant has its specific needs. Therefore, a person will need to follow the directions that are specified on the seed or plant package. Usually, a plant will need to receive the proper amount of sunlight each day to fully grow. It will also need to be watered. 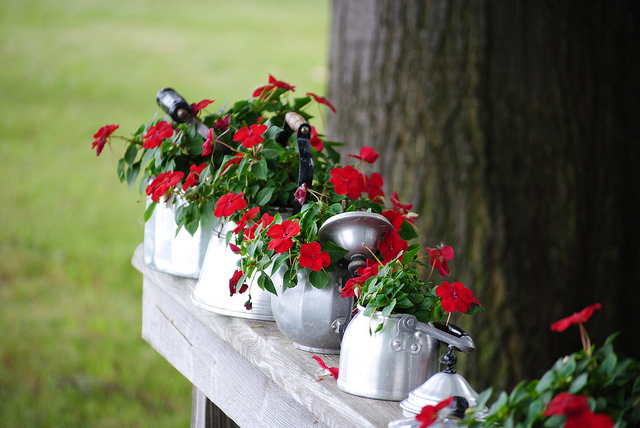 Some flowers and bushes may require additional pruning as they grow. Once the garden has been planted, the patio will soon be in bloom with beautiful plants and flowers. By carefully analyzing the patio area and choosing plants that can thrive within its environment, anyone can create a patio garden that will offer many seasons of beautiful plants to enjoy. Peter Wendt is a writer from Austin, TX. He just picked up the hobby of gardening, and has started growing plants and vegetables under his patio cover in Austin.